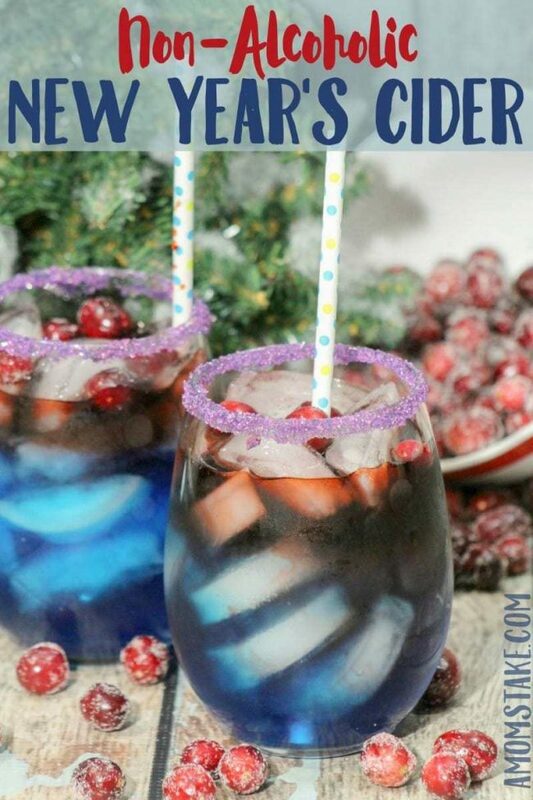 Blend a touch of sparkling cider with two fresh flavors with this kid friendly New Year’s Sparkling Cider Drink recipe! 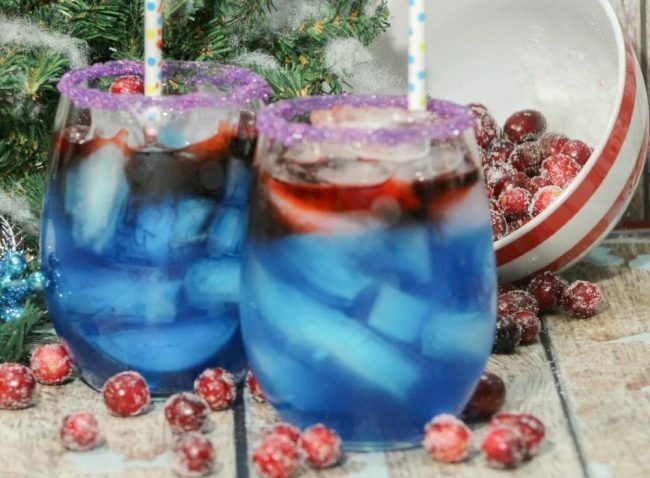 It’s a fun drink that is perfectly festive and yummy! Best of all, it’s really easy to put together and something the entire family can enjoy. Fill a large pitcher half way full of ice. Add 2 bottles of blue Gatorade, 1/2 bottle of apple ginger sparkling cider, and 1/2 liter of Sprite. Stir until well combined. Dip the rim of each glass in water. Pour sanding sugar on a plate. Dip the rim of each glass into the sanding sugar for a festive glass. Fill each glass 3/4 full of ice. Pour your punch mixture into the individual glasses. Add 2 tablespoons or 2 oz of cranberry juice into each glass. Garnish with fresh cranberries. That’s all there is to it! 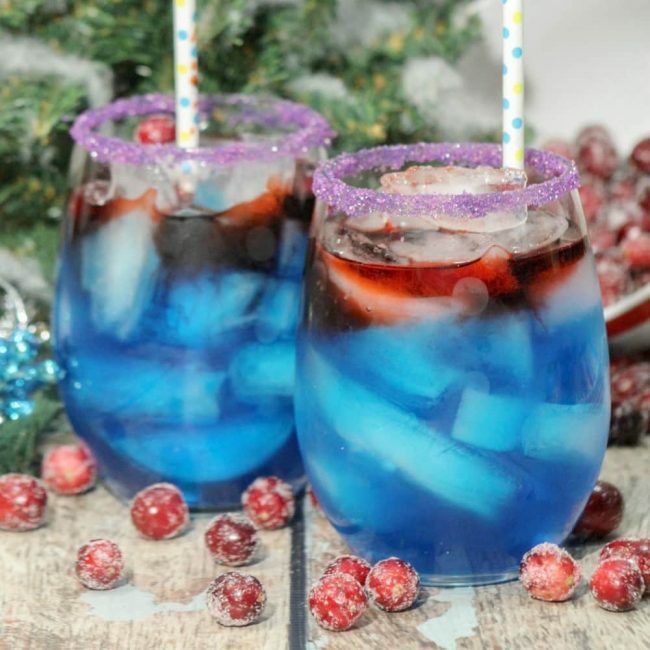 A sweet, sparkling cider inspired drink that has a rich blue color with a great pop of red that will blend the flavors together as you drink. It’s really fun to add to the festivities of New Year’s Eve with a drink that adds to the excitement of the celebration. These will definitely be a fun addition to our family friendly New Year’s Eve party this year! I love the colors on this! I bet kids and teens would appreciate such a fun drink as much as the adults. This looks so pretty! I bet the kids would enjoy it as much as I would. Such a pretty drink! I love that it’s non-alcoholic perfect for the whole family. I love how beautiful these drinks look! The colors are amazing and perfect to celebrate with! Oh those look like so much fun!!! Would be so fun to make for the holidays!